Following an accident it's normal to worry about your health, medical bills, car repairs, time out of work, and transportation. You shouldn't have to worry if you have the best personal injury lawyer representing you. Call us today at 704-714-1450. I highly Recommend my family and friends They did an Awesome Job I am Greatly Satisfied and Happy with my ResultsThey make sure you are well taking care of. They Aim for Victory..
We’ve represented thousands of people for their personal injuries without ever advertising on television, the phone book, billboards, the radio or direct mail (see our No Advertising Policy). We limit the number of clients we accept each year to allow us to spend more time on our cases and get the results our clients deserve. We’ve built our firm on the belief that a satisfied client is the best advertisement. We find our clients are more comfortable knowing that our reputation was built on our results rather than billboards and TV ads. Defendant denied liability and blamed our client for causing the accident. Further, our client's blood alcohol level was above the legal limit. Settled right before trial. Individual defendant got intoxicated at a bar. While not disclosed by the individual we were able to find the offending bar and file a lawsuit. While the Bar denied being responsible they eventually settled for full insurance policy. Defendant denied liability and blamed our client for causing the accident. We filed suit against the defendant, defendant's employer as well as five other businesses associated with the defendant. Following extensive litigation and multiple mediations the case resolved shortly before trial. Our client was injured when her implanted medical device failed. Originally worked as a medical malpractice claim, we changed our focus and we able to resolve the case after we filed a lawsuit against the manufacturer. Defendant hospital failed to properly read an x-ray, which resulted in traumatic injuries to our client. Additional details prohibited under a confidentiality agreement. Settled after we filed a lawsuit. Additional details prohibited under a confidentiality agreement. Looking for a Lawyer Near You? Personal Injury from a Drunk Driver? For two consecutive years the attorneys of Rosensteel Fleishman were named the Mecklenburg County Bar LRS’s Lawyer of the Year! INJURED? 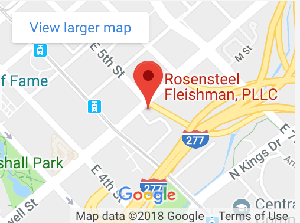 ROSENSTEEL FLEISHMAN IS HERE TO HELP! Have you been in a car accident? Was a loved one involved in a wrongful death or medical malpractice? Rosensteel Fleishman helps people in Charlotte and throughout NC. Contact us today to speak with one of our lawyers. We will discuss your rights, options and how we can help you.